This article contains rolling updates and additions of my own real-life trading activities and their results, with newest additions on top. Also see the About-page for more information. 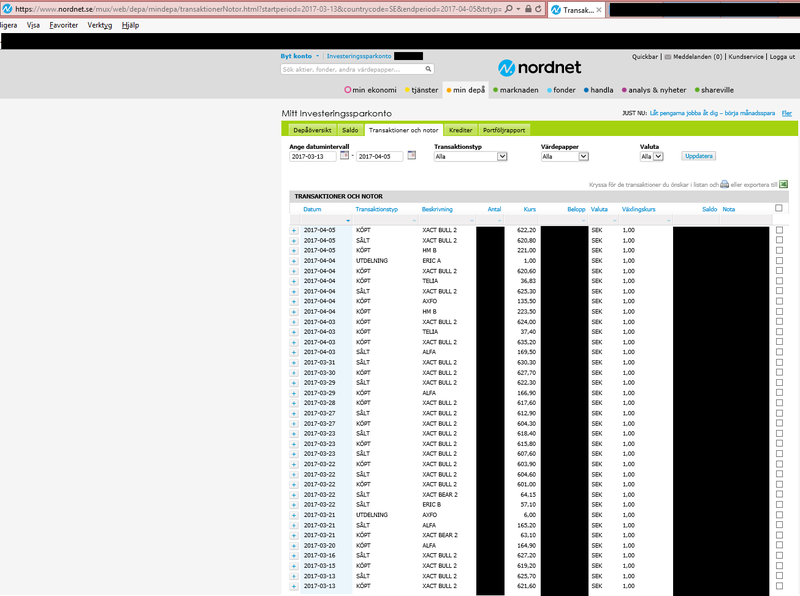 The screenshots are taken from the Swedish site Shareville.se which is connected to the brokerage NordNet which I use for my trading. Shareville does not allow any practice account at all – only accounts with real money are shown. Thus, the results below are the result of real trading with real money. I’ve removed some information about my account name and follower count – because I don’t want any followers. If I do get a large number of followers, I’ll be accused of front-running, and thus I have chosen to remove my account display name from the screenshots. 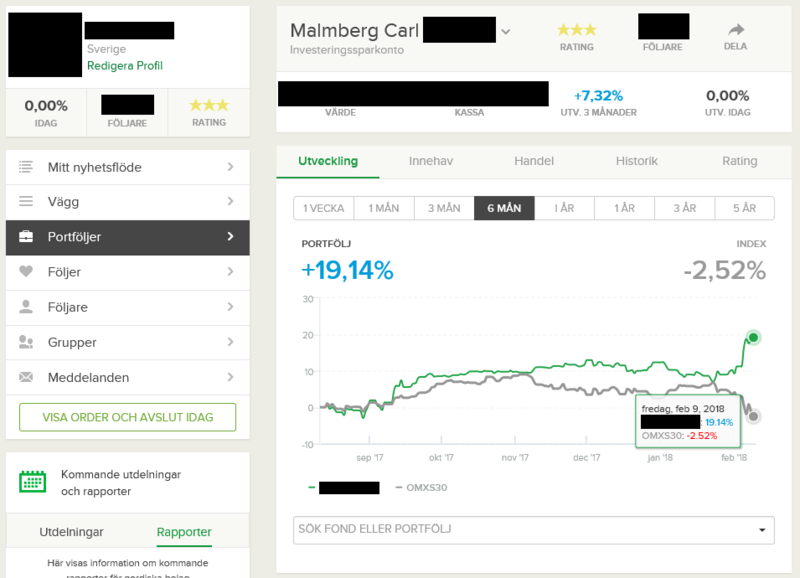 2018-12-31: Link to article about my 2018 trading performance. This chart shows my 1-year rolling trading result up to 2018-07-10. As is evident from the chart, I strongly outperform our Swedish bluechip index OMXS30, which has yielded -4.51% during the recent yearly period, whilst my portfolio is up +23.32% during the same period. 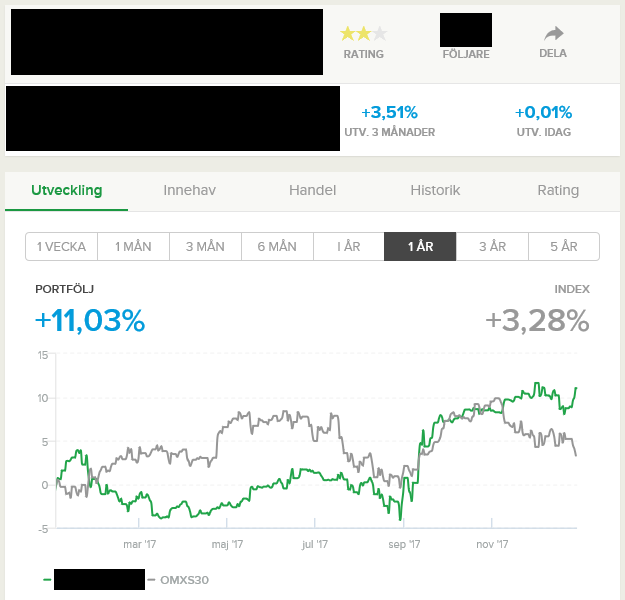 Counting from the 1st of January 2018 to the 2nd of July 2018, my actively traded hedged portfolio has returned +10.64% YTD while the Swedish bluechip index OMXS30 has returned -2.29%. I continue to strongly outperform my local Swedish stock market using the Extended Elliott Wave Theory. 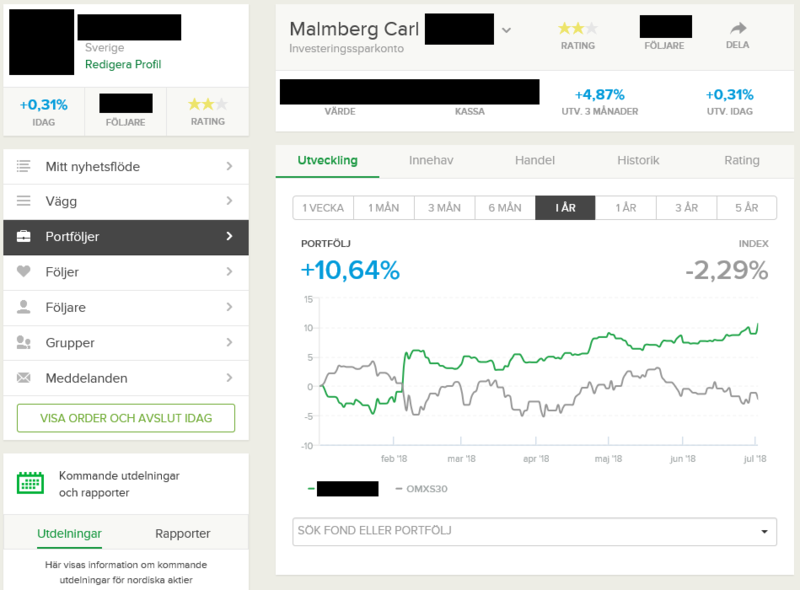 Counting from the 1st of January 2018 to the 3rd of May 2018, my actively traded hedged portfolio has returned +8.79% YTD while the Swedish bluechip index OMXS30 had returned -0.63%. I continue to outperform the Swedish stock market. 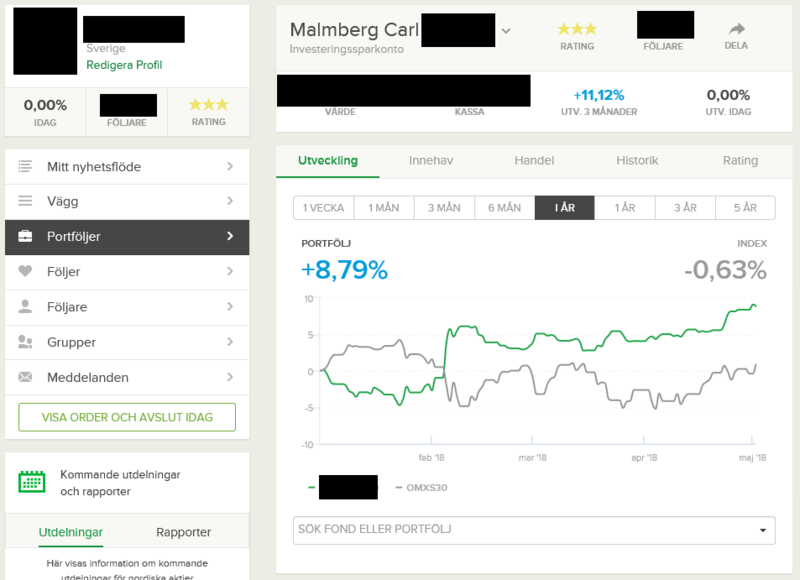 Post the crash, I now have a 3-star rated portfolio which has returned approximately +19% during the last 6 months, while our Swedish stock market index has returned -2.5% during the same time period. Read more here: “My profits from the recent crash.”. 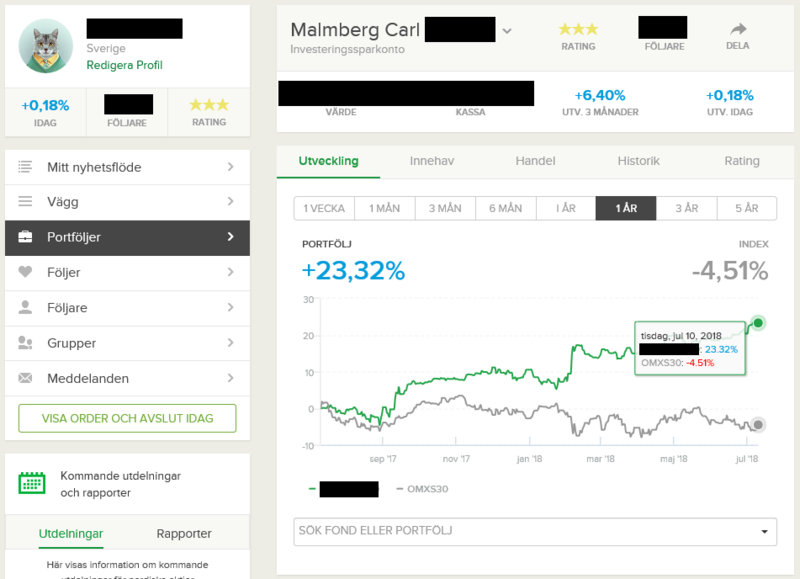 I outperformed the Swedish market considerably, with my strategy of hedging my selection of blue-chip-semi-perma-positions against market turmoil. The result was a significant outperformance of our blue-chip index OMXS30 which only returned +3.28% (ex. dividends, about +5.8% with dividends). 2017 was a choppy trading year on our market, which unlike the US stock market, didn’t rise continuously. Nonetheless, I managed to considerably outperform the market, being up +11.03% during 2017. The main purpose is to make money from our readers. We do this by striving to provide an excellent continuous analysis coverage of the 20 global financial markets we’ve chosen to analyze on a continuous basis. To this end – and of course for our own trading – we’ve developed an extension to the original Elliott Wave Theory, which we simply call “Extended Elliott Wave Theory” for now, and we use this plus other technical analysis methods in our work. The second purpose behind our analysis service is to fulfill our wish to communicate with a readership – albeit mostly one-way. The third purpose is to increase the quality of our work, as well as our pace of learning – by the additional pressure of making our work available to willing clients. Since we ourselves trade and invest on the financial markets, increasing our knowledge and skill levels provides benefits for us, plus our readership. EWT Investing (and all of our analysts/writers) are wholly independent from other business in the financial sector(s) – including but not limited to banks, retail brokers, insurance companies, other analysts, and retailers of computer programs and apps for analyzing the financial markets, and data providers. However, we are customers and clients of banks, brokers, vendors and makers of computer programs for analyzing and trading the financial markets, and data providers. We are not affiliated with any political party anywhere in any jurisdiction. We do not maintain any relationships with any lobbyists for any group, particular interest, conglomerate or company. We are not affiliated with any newspapers or news organizations anywhere (except those co-owned by us).